Summarising the new models presented by Audemars Piguet at this year’s SIHH is no easy task. Even with the terse prose used by the company’s copywriters, the full press kit runs to a whopping 85 pages! I will attempt here to summarise just the Royal Oak Offshore models in the customary 500 words of a standard WorldTempus article. 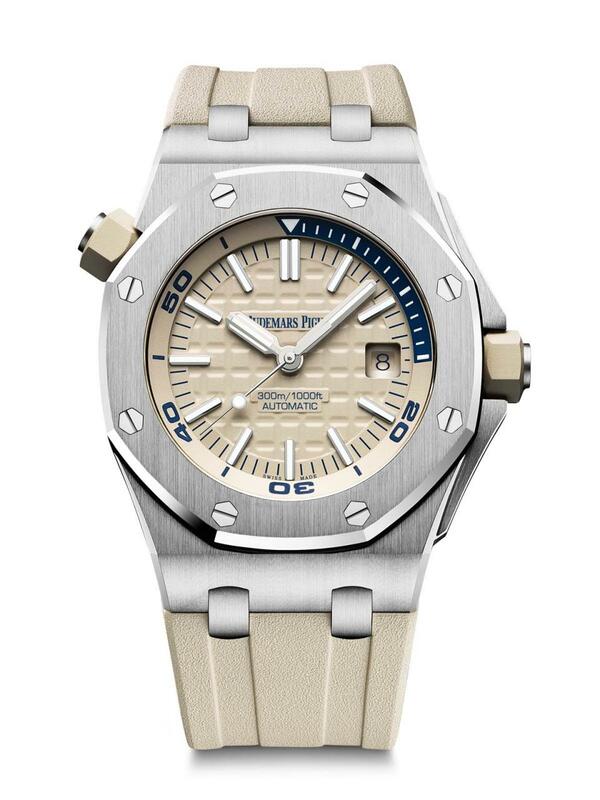 The Royal Oak Offshore celebrates its 25th anniversary this year. Launched in 1993, it built on the success of the original Royal Oak from 1972, which has now gained legendary status as the first luxury watch that had a case in stainless steel rather than a precious metal. At the time, the Royal Oak’s 39mm case was nicknamed “Jumbo”, which just goes to show how tastes have changed over the past 45 years. The visible screws fixing the octagonal bezel to the case were also rule-breaking at the time and have since been “paid tribute to” in watch industry parlance by other high-end watch brands. In 1993, the Royal Oak Offshore took things further with an even bigger case with a 42mm diameter and an increased thickness that gave it an even more imposing look. 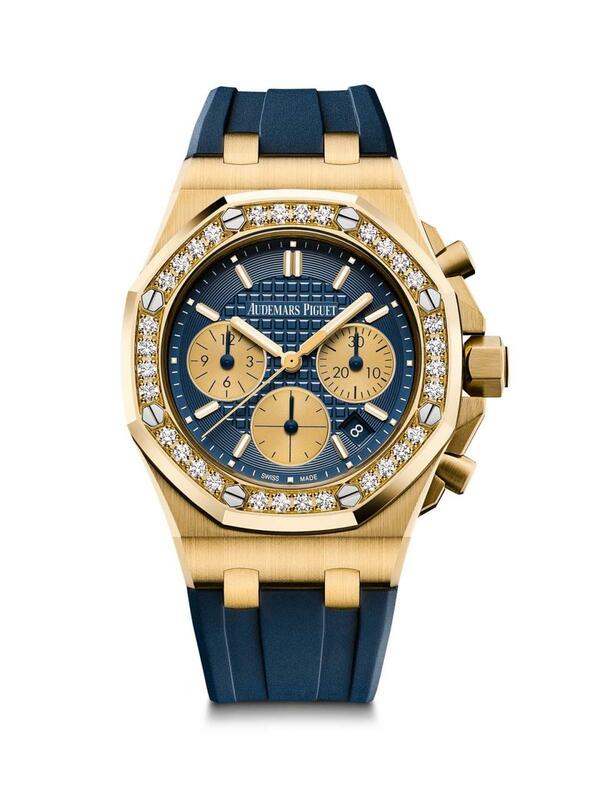 What began as a defiant use of stainless steel in a product where it was not expected has continued with the use of other innovative materials such as forged carbon, tantalum and ceramic and has also evolved to include all three gold colours (Audemars Piguet spearheaded the renewed use of yellow gold over the past few year) and platinum. The brand from Le Brassus seems to have missed a trick with the number of references it has launched for the 25th anniversary of the Royal Oak Offshore, since there appear to be 26 – one more than one would logically expect. Perhaps we can forgive them this unusual oversight if we consider the 42mm chronograph in rose gold as a single model, whether you prefer it on the gold bracelet or grey alligator strap (which naturally makes a big difference to the price). We already covered three of these 26 models, the 2018 re-edition of the original Royal Oak Offshore chronograph and the mould-breaking new limited-edition tourbillon chronograph, in the week before the SIHH. But what about the rest? At the top of the range are two Grande Complication models in ceramic (one black, one white) equipped with the Calibre 2885 self-winding movement which includes a split-seconds chronograph, perpetual calendar and minute repeater all inside a 44mm case. At the aesthetical opposite is a new stainless-steel model with the same 44mm case diameter but with a green ceramic bezel, beige dial with brown counters and a camouflage rubber strap (an additional khaki green rubber strap supplied with the watch allows you to tone down the look if required). 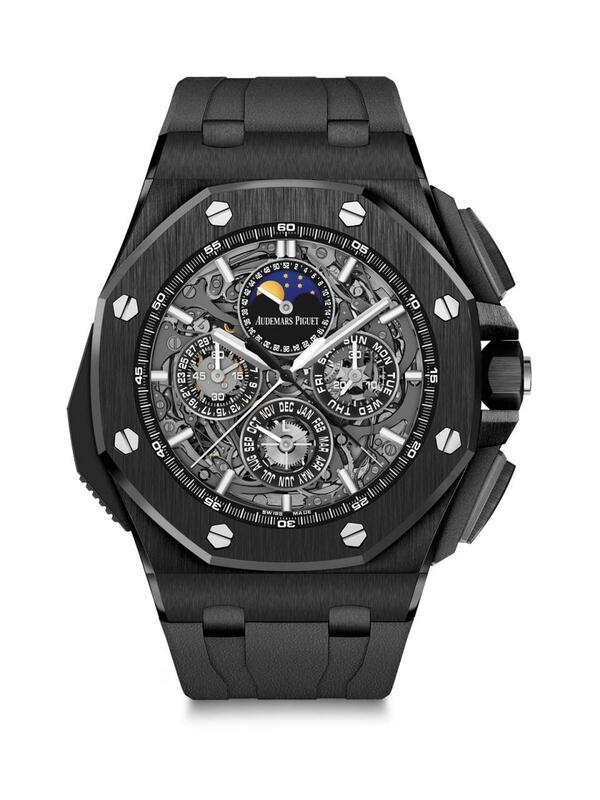 SIHH 2018 celebrated the 25th Anniversary of the Royal Oak Offshore, a bigger version of Royal Oak which Audemars Piguet has often utilized to excite the market.Two variations of this Royal Oak Offshore Tourbillon Chronograph, every limited to 50 pieces, are big, in 45mm, but assembled so that the movement appears suspended from the bezel.We went though a great deal of options and talks on the bezel and eventually we decided yes, we should start the bezel because we are only likely to do this once and we would like to create the perception that the movement has been held by this ruse.In a fast-changing retail arena, Bennahmias states Audemars Piguet has a distinct advantage in being a family-owned firm, permitting a fast response to market forces. We have a clear strategy of where we are going, he says. We want to maintain complete charge of our destiny.The thin series has a new Jumbo Extra-Thin, this time in platinum and titanium. 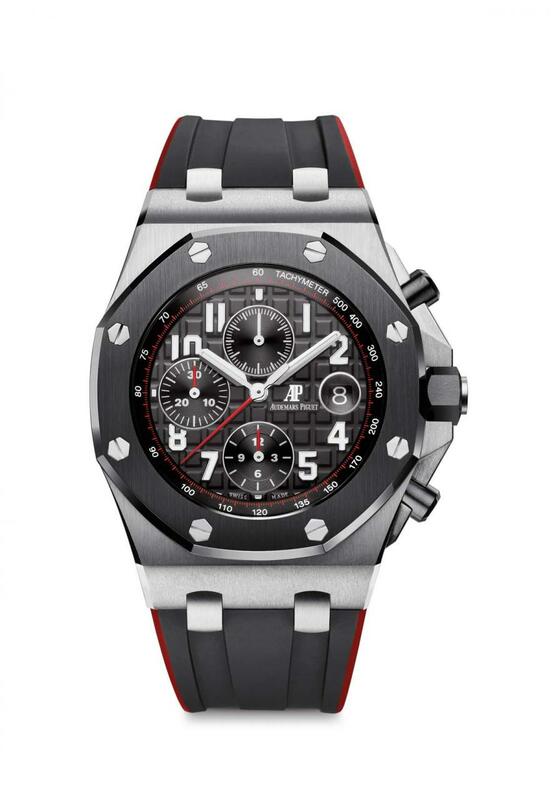 Coming in at 39 mm, this is the nearest watch in APs lineup to Grald Gentas first 1972 Royal Oak. The selling point of this new version, however, is the titanium case with polished 950 platinum bezel and hyperlinks. The bracelet is also titanium and features a titanium fold grip. The rich blue tapisserie dial is stunning and the unique mixture of materials has made this view instantly jump into the peak of a couple of my coworkers wish lists.Now, these are super awesome. While the 3 watches in this group (stainless steel, 18K pink gold, and platinum using a blue sapphire bezel) continue the ultra-thin trend, they also present a tourbillon and fresh dial formation to this years models. Stepping down to the 42mm case size, there are new models in stainless steel with a blue dial and an all-grey titanium version with titanium case, grey ceramic bezel, grey dial with silver-toned counters and a matching two-tone rubber strap with light grey rubber on top and dark grey on the sides and back. For those looking for sportier models there are two new stainless-steel versions with a black dial with red accents and matching black and red rubber strap or a brown dial with blue counters and brown alligator leather strap. For the ultimate touch of prestige there is also a full-platinum version with the case, bezel and bracelet tin 950 platinum. The 2018 collection also includes five new Royal Oak Offshore Diver models, one in rose gold and four in stainless steel with daring turquoise, beige, khaki and purple dials and matching straps. It’s the stereotypical watch for lounging by the pool on the Riviera this summer.